Mission Specialist Randy Bresnik (far left) and the STS-129 and Expedition 21 crews celebrate the birth of his daughter Abigail Mae Bresnik on Nov. 22, 2009. This story was updated at 7:28 p.m. EST. Talk about one proud papa. Astronaut Randy Bresnik beamed with joy Sunday after hearing news of the arrival of his new baby daughter, who was born on Earth while he orbited above on the International Space Station. 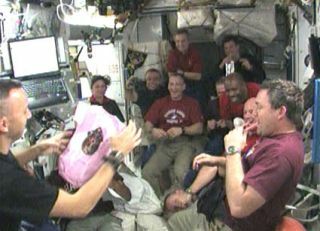 Wearing a t-shirt emblazoned with the phrase "It's a Girl," Bresnik passed out pink bubblegum cigars (smoking is prohibited on the station) to the 11 other astronauts with him on the space station and linked shuttle Atlantis. He even unveiled a pink onesie decorated with his mission's patch for his daughter, Abigail Mae Bresnik. The astronaut announced the birth of baby Abigail Sunday morning after two days of waiting for news. His wife Rebecca had the baby in Houston Saturday night at 11:04 p.m. local time on a day that also included Bresnik's first-ever spacewalk outside the station. "Mama and baby are doing very well," Bresnik radioed Mission Control. He thanked the flight controllers there and all of NASA for their support. "On behalf of the planet Earth ground team, please accept our heartfelt congratulations," Mission Control said. Abigail weighed 6 pounds, 13 ounces and 20 inches long when she was born. She is the second child for the Bresniks, who have a 3-year-old son, Wyatt, whom they adopted in Ukraine last year. Bresnik and his wife had expected their daughter to be born on Friday to avoid a potential conflict with the astronaut's two spacewalks for this mission. He's due to venture back outside the station on Monday. Bresnik is just hoping for pictures soon, and lots of them. "Hopefully, I'll be able to hear and see the pictures and be able to talk to her maybe on the [Internet Protocol] phone and see some video shortly thereafter and be home, hopefully, only a few days afterwards," Bresnik said in a NASA interview before the mission. Mission Control planned to set up a space-to-ground communications link between Bresnik and his wife so he wouldn't miss the baby's arrival. Mission Control roused the astronauts early Sunday with the song "Butterfly Kisses," a song about a father and his daughter, by Bob Carlisle, which Rebecca Bresnik chose specially for her astronaut husband. Bresnik spoke with his wife while she was in labor late before heading out on the spacewalk Saturday, but the astronauts agreed to forgo updates during the excursion while he was working outside the station. It was early Sunday morning, when Bresnik's wife called him to report Abigail's arrival, that he learned of the birth. "Congratulations!" Atlantis astronaut Robert Satcher, Jr., an orthopedic surgeon, told Bresnik's wife in a video broadcast on NASA TV. "Way to go Rebecca," added crewmate Leland Melvin, a former NFL football player. "You endured some serious labor pains and I think it was all worth it for a beautiful baby girl." It is only second time in history that an American astronaut has been in space when his child was born. NASA astronaut Michael Fincke coached his wife Renita through the birth of their daughter Tarali Paulina from the space station in June 2004 during his long-duration mission. Fincke had to wait he landed in October of that year to hold his daughter, then four months old, for the first time. "I wish the Bresniks all the best," said lead space station flight director Brian Smith before the baby's birth. "This is a very exciting time for both Randy and Rebecca." Bresnik said he was disappointed to miss his momentous family event, but would be home much sooner than Fincke. Atlantis is due to land in Florida Friday, the day after Thanksgiving, an American holiday also known for family get-togethers. The mission is delivering tons of spare parts to the space station, though the astronauts will have some much deserved time off today. He also said many families, like those of deployed military personnel, experience the same timing conflicts all the time. In an ABC News interview before flight, Bresnik and his wife said they were surprise of Rebecca's pregnancy because they believed she couldn't have children. Because of medical reasons, doctors opted to induce the birth two weeks early, which allowed the Bresniks some wiggle room in selecting a delivery date for their daughter. Before Atlantis launched, Bresnik's wife said she understood the conflict for her husband, especially since he spent an entire year training for this spaceflight, which is his first since joining NASA's astronaut ranks in 2004. "I'm a little disappointed that he won't be able to be there, but understanding that we don't choose the timing, and excited that he's doing what he's doing," she said. "So, I'm excited for him to come home safely." Bresnik will have to wait an extra day after returning to Earth to see his daughter for the first time. He told Rebecca not to come to his landing so soon after the delivery, especially since it's always possible Atlantis' return could be delayed or redirected to a backup runway in California. But no matter which day Atlantis lands, Bresnik and his crew, commanded by Charlie "Scorch" Hobaugh, plans to waste no time to meet his daughter face-to-face. "As soon as possible," Bresnick said. "I will look forward to that landing and Scorch to make it nice and safe. Probably more than anybody has in the history of the space shuttle program." SPACE.com is providing complete coverage of Atlantis' STS-129 mission to the International Space Station with Staff Writer Clara Moskowitz and Managing Editor Tariq Malik based in New York.